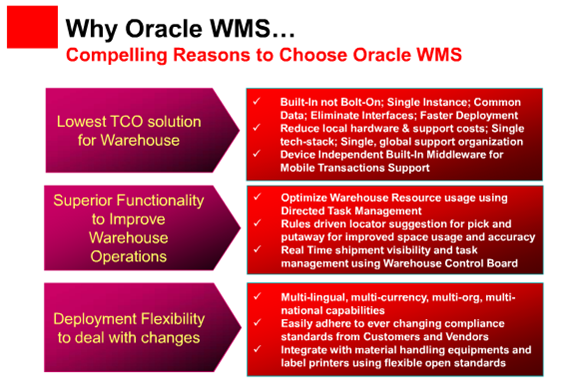 Oracle Warehouse Management System (WMS) is an advanced inventory module with lot of efficient, unique and enhanced features that improves productivity of distribution centers, manufacturing and inventory handing processes. It supports manual data entry, data entry through barcode scanning and through RFID too. 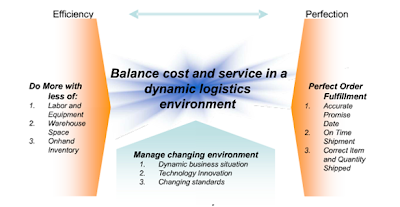 It enables organizations to maximize their utilization of labor, space and equipment investments by coordinating and optimizing resource usage and material flows across a global supply chain on a single platform. Oracle WMS provides a robust warehouse solutions platform to efficiently manage the flow of goods and warehouse resources across a wide variety of business processes including order fulfilment, manufacturing, field service, inbound logistics-from receipt, inspection to storage, counting and replenishment. Oracle WMS enables users to optimize resources such as storage space, labor and equipment using rules based execution. Putaway rules based on configurable parameters like velocity, volume and material classifications. Rules can be used to minimize fragmentation, enforce storage policies, reduce obsolescence or implement other storage restrictions. Similarly pick tasks for outbound orders can be generated considering one or more goals such as reduction in material handling (tasks for full or split cases), reduce travel time (nearest location), minimize obsolescence (FIFO) or other customer specific preferences (grade, color, size, etc). Using wave planning, Oracle WMS can fulfil a large number of orders quickly by streamlining the full execution process. Oracle WMS provides a flexible and powerful planning tool with a dashboard to create, plan and track wave progress, drilldown to task or line level and the ability to configure exceptions to facilitate proactive resolution of issues. Advanced Wave Planning also includes task planning features that can be used to group and dispatch tasks based on an execution criteria. Oracle WMS can identify crossdocking opportunities in the warehouse by matching expected receipts with outbound shipments and manufacturing component requirements using flexible crossdock rules. These rules allow the users to have greater of control over supply and demand eligibility for crossdocking and minimize the product wait time in outbound staging areas before getting crossdocked. Oracle WMS offers Push and Pull based replenishments to forward pick area for warehouses to efficiently pick high volume of orders lines. The Pull replenishment feature automatically creates a replenishment task when a potential shortage is detected in the forward pick area. The dynamic replenishment execution capability ensures that pick areas are replenished with minimal oversight and pick tasks are dispatched only when material is available to pick. Push based replenishment allows a warehouse to effectively manage a surge in demand e.g., promotions by replenishing a forward pick area based on future demand visibility of an item. Oracle WMS facilitates integrated transportation planning and execution by leveraging the dock door appointments created in Oracle Transportation Management (OTM). Oracle WMS ensures that orders are released based on the dock appointments and material is staged to the correct dock door. Oracle WMS improves trailer loading by recommending loading of containers in the reverse stop sequence of a multi-stop shipping itinerary. Competitive pressures and globalization is forcing traditional warehouses to take on value added services previously reserved for manufacturing and service centers. It is forcing manufacturing centers to take on warehousing and order fulfillment activities. Oracle WMS offers advanced material and resource handling capabilities for these additional business flows. Oracle WMS also offers the materials management feature set required in reverse logistics operations. Users can define required return product flow to guide subsequent inspection and rework processing (repair, teardown, etc.). This enables users to seamlessly manage reverse logistics operations in the same distribution centers that handle vendor receipts and customer order fulfilment. Oracle WMS provides a seamlessly integrated system for all manufacturing execution processes including repair and maintenance business processes. Oracle WMS supports component picks for discrete jobs and schedules, ingredient picks for process manufacturing batches, parts picks for maintenance work orders and repair orders generated in Enterprise Asset Management or Depot Repair. To adapt rapidly changing business requirements driven by customers, regulatory bodies, new product introductions, fluctuating demand and global outsourcing, Oracle WMS provides a configurable, rules-based infrastructure that easily adapts to changing business needs and compliance mandates without customization. Customers can deploy WMS in a decentralized environment that is physically decoupled from rest of the E-Business Suite (EBS), making it possible to leverage the latest features in WMS but with older EBS installation or potentially non-EBS host systems. Distributed WMS also ensures greater availability of WMS instance, it is an “always on” solution that is unaffected by the network connection or the general availability of the host system. Oracle WMS provides flexibility to warehouses to choose a pick methodology that is aligned with the ordering profile of the item. It supports pick and pass, zone picking and cluster picking to reduce warehouse travel. It enables one-step pick and pack directly into shipping cartons thus eliminating downstream packing operations. Oracle WMS facilitates efficient transaction processing by enabling users to configure mobile transaction pages for their specific needs. This allows the user to view or enter only the required information that is needed to complete the transaction for a specific business context. 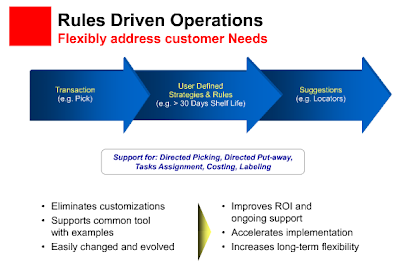 Oracle WMS has, at its core a flexible and powerful business rules engine, which permits extensive tailoring of key WMS processes such as directed picking and putaway, labeling, material routing selection and task dispatching without the need to customize code as shown in Figure 2. This extensible rules based architecture enables key processes to evolve and adapt dynamically. Oracle WMS provides out of the box support for RFID and EPC technology for addressing RFID labeling compliance. EPC’s can be extracted from an inbound ASN and provided on outbound ASN’s to customers. Oracle WMS also provides a flexible framework to automate any warehouse transaction via RFID or any other sensor based on an event detection infrastructure. Warehouse Control System (WCS) feature in Oracle WMS provides out of the box integration with material handling equipment such as conveyors, carousels, ASRSs, pick to light and even voice directed picking systems. Customers can deploy diverse equipments using an open API device integration to request tasks, and receive responses from diverse equipment types. Managerial workbenches enable real-time monitoring of the equipment and provide real-time visibility to the entire automation environment. wow, what a great effort. thanks for sharing us such a nice post . It seems to be nice overall nice blog and thanks for share this. Thank you for bringing this information about this article. Chicago Third Party Logistic Warehouse .